I certainly wouldn’t have expected it. Dallas Braden is far from a household name. He plays for a small market club, the Oakland A’s. He’s only making his 53rd career start. He grew up in adversity in Stockton, California. 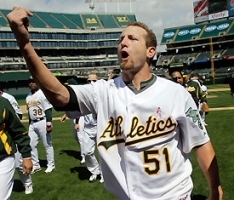 Nevermind all that; Dallas Braden became one of the few men in Major League Baseball history to throw a perfect game when he blanked 27 straight batters to beat the Tampa Bay Rays 4-0. To put this achievement into historical perspective, that’s only the 19th perfect game in Major League history. It’s also the first complete game Braden’s thrown in the majors, making the feat all the more impressive given that he’s never gone a full nine innings before! It’s tough to throw a perfect game on a video game, but to do it in real life should net Dallas Braden a little more than a million dollars when it’s time to renew his contract. His name is in the record books now. No matter what else he might do in his career, he’s joining legends.